No, it’s not a GP5/SSB, but at less than half the cost it’s fine for general use. Anna is first-rate to deal with, too. Indeed she is, Ron! I’ve only has excellent experiences working with Anon-Co.
You can buy directly from Anon-Co’s website, or via eBay. This entry was posted in Deals, News, Radios, Shortwave Radio and tagged Anon-Co, PL-360, Tecsun, Tecsun PL-360 on January 21, 2016 by Thomas. “Regarding the S-8800, there is no information available of when this will be actually launched. I think that the absolute earliest could be some time in January, but I expect that it will be after Chinese New Year. To be honest, it is very difficult to say at this moment. There isn’t much information available about it yet. Supposedly it is pretty much the same [chassis design] as the existing BCL-3000, but it will be a PLL radio with DSP IC. It should have SSB features, but other details (like SYNC) I’m not aware of at this moment. I’m hoping to hear more about this soon. Anna will contact me as soon as she has more info about the S-8800 features and availability. This entry was posted in New Products, News, Radios, Shortwave Radio and tagged Anon-Co, S-8800, Tecsun, Tecsun S-8800, Tecsun S-8800 availability on November 16, 2015 by Thomas. The Tecsun PL-680 is now available on eBay via my favorite Hong Kong-based seller, Anon-Co. Pricing is currently $105.99 + $18.00 shipping to UK/US, $29.00 shipping to everyone else. Click here to read my review of the PL-680. Click here to search eBay for the PL-680. This entry was posted in New Products, News, Radios, Retailers, Shortwave Radio and tagged Anon-Co, PL-680, Tecsun-Tecsun PL-680 on April 27, 2015 by Thomas. When I heard early reports about the new Tecsun PL-680, I was already wondering how it would stack up alongside other Tecsun portables. An early photo of the Tecsun PL-680 revealed how very similar it is, indeed, to the Tecsun PL-600, which has been on the market for many years. Moreover, the features of PL-680, which I heard about only a few weeks ago, sounded to me like a carbon copy of the venerable PL-660. I investigated further, and spoke with Anna at Anon-Co; she was given to understand that the Tecsun PL-680 was essentially a re-packaged PL-660 with improved sensitivity. I was curious enough about the PL-680 that I ordered one from Anna as soon as they were available, even paying for expedited shipping in order to have it in hand a bit sooner. 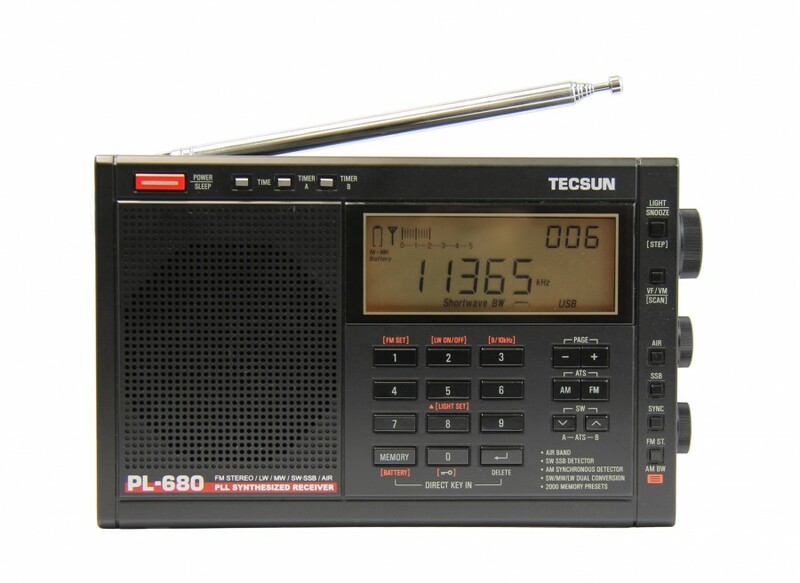 The Tecsun PL-660 has been on the market for several years now; it’s one of the most popular shortwave portables on the market. And for good reason: the PL-660 is relatively inexpensive, simple to use, packs all of the most vital and desirable functions/modes, and is available from a variety of retailers that ship worldwide. I have reviewed it numerous times and often used it as the basis for comparison with other shortwave portables. It’s China-based manufacturer, Tecsun, has emerged over the past few years as the dominant manufacturer of shortwave radios. I posted a few unboxing photos the day I received the PL-680. The Tecsun PL-680 looks like the Tecsun PL-600 body, with the Tecsun PL-660 features and layout. Indeed, the full complement of buttons, switches and dials are identically positioned to those of the PL-660. Question: So, does the PL-680 have more functions than the PL-660? Answer: No. It appears to be, and likely is, identical in every (functional) respect to the Tecsun PL-660. No surprises here, unless there are hidden features I haven’t discovered…! The similarity is so striking, in fact, that I believe the PL-680 is the first radio I’ve ever turned on for the first time, only to find I immediately knew every function. I’m so familiar with the PL-660 that I could even use the PL-680 in the dark the first night I used it. It also helps, of course, that the PL-680 is nearly identical to the PL-600, too, which I’ve owned for many years. In truth, I was quite disappointed that Tecsun did not add a line-out jack to the PL-680. 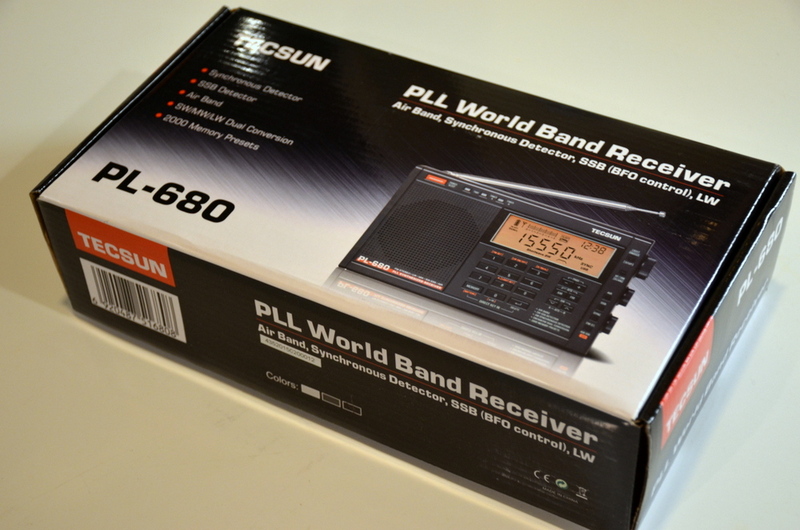 The PL-660, alas, lacks line-out, and though my Tecsun PL-880 has a line-out, its default shortwave volume is simply too high to be used by most digital recorders. 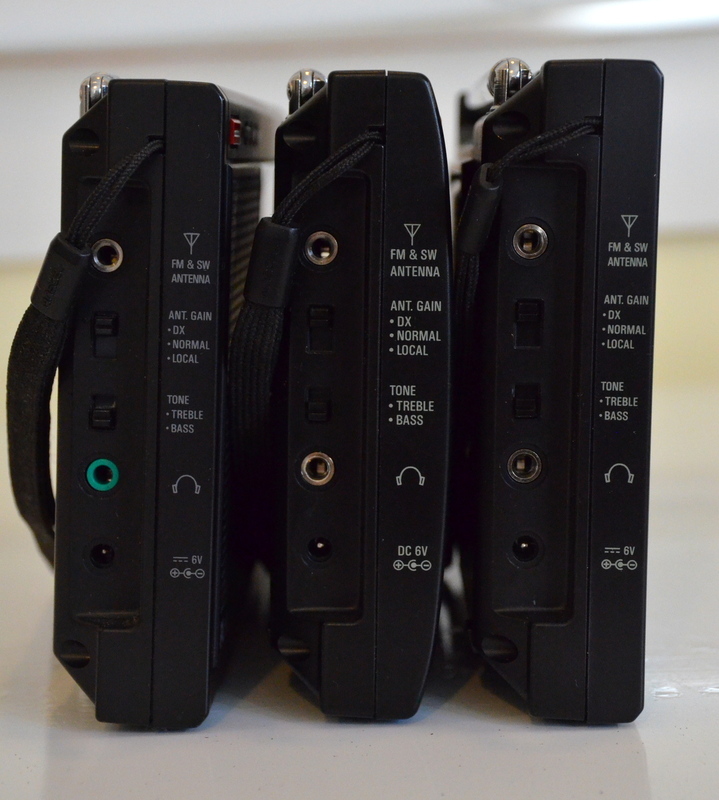 I had hoped that the PL-680 might have a proper line-out jack, potentially making it a replacement for my trusty Sony ICF-SW7600GR. Unfortunately, this is not the case. But other than missing a line-out jack, I really have few complaints. I’ve always been a fan of simple radio design and I believe Tecsun has done a good thing by keeping the user experience so similar in their PL-6XX line of portable shortwave radios. Apparently, a good thing is a good thing. Question: Does the PL-680 have any performance advantages over the PL-660? I should add here that I’m about to get rather technical and radio-geeky, so if you’re only interested in a summary, please skip to the bottom of the page. 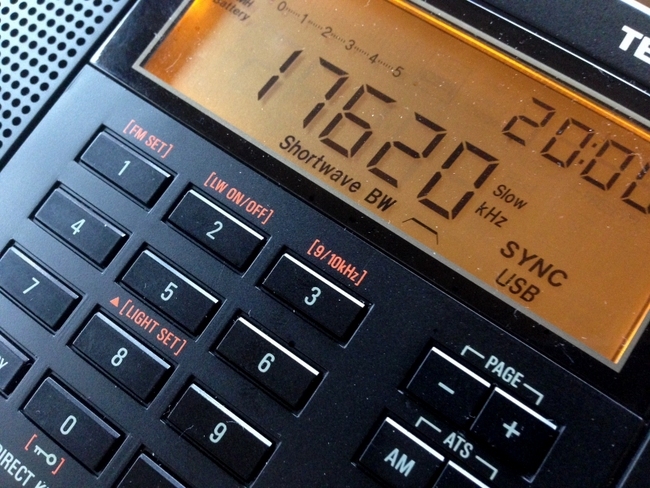 Since I spend 95% of my listening time on shortwave, I’ll begin with shortwave performance. Again, we’ll compare the PL-680’s performance with that of the PL-660. In most circumstances, you’ll find that the PL-680 has better sensitivity than the PL-660. It’s a marginal improvement, but one I certainly notice on the shortwave bands–and so did the majority of readers who participated in the shortwave AM reception survey. The survey had recordings from a total of three broadcasters: Radio Prague, WWV, and Radio France International. The Radio Prague recording was quite strong and was the only broadcast in our survey in which the PL-660 and PL-680 ran neck-and-neck. In truth, I believe strong signal reception on both these radios is excellent and nearly indistinguishable from each other. Based on comments from those who participated, the PL-680 came out ahead of the PL-660 in two respects: better sensitivity, and more stable AGC. In both sets of recordings, the signal was weaker than the Radio Prague recording, and QSB (fading) more pronounced. Herein lies a well-known weakness of the PL-660: soft muting and a sometimes over-active AGC equates to more listening fatigue. Here is a chart with the full survey results based on 194 listener reports. The number of responses are represented on the vertical axis. Obviously, the engineers at Tecun addressed the soft muting/AGC problem of the PL-660. In all of my time with the PL-680 on the air, I haven’t noticed any soft muting; the audio has been smooth and the AGC copes with fading much better than the PL-660. No doubt, these two improvements alone make the PL-680 a worthy portable for shortwave radio listening. There is a downside to the improved sensitivity, however: the PL-680 has a slightly higher noise floor than the PL-660. This is mostly noticeable during weak-signal listening. Though I haven’t compared it yet, I’m willing to bet that the noise floor is comparable to that of the Sony ICF-SW7600GR. Personally, if increased sensitivity and stability means a slightly higher noise floor, I’m okay with that. I find that I listen better when the signal is stable and not fluttering/muting with every QSB trough. The second survey focused on synchronous detection, which is a very useful receiver tool that mitigates adjacent signal interference and improves a signal’s stability. Perhaps it was my good fortune that the same day I tested synchronous detection, fading on even strong stations was pronounced at times. Perfect! The first recording set was from Radio Australia, a relatively strong signal here in North America. Still, QSB was pronounced–making for an unstable signal–and there was hetrodyne interference in the upper sideband of the broadcast. When I switched the radios into lower sideband sync, halfway through, it effectively mitigated the hetrodyne in all of the recordings. 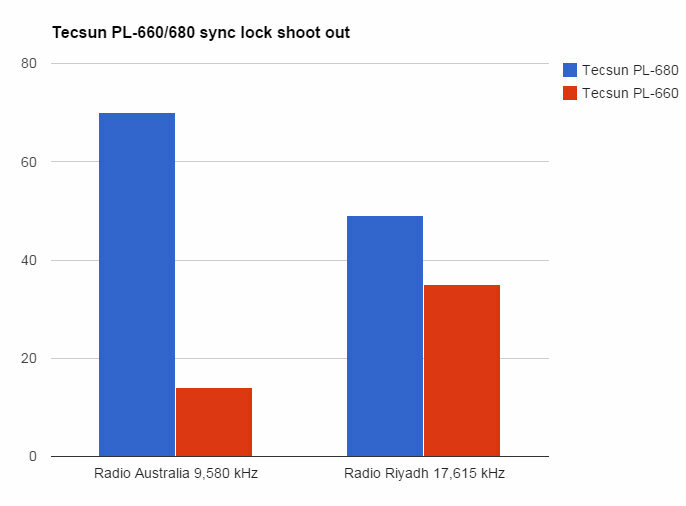 While I have always considered the PL-660 to sport one of the stronger sync locks in current production portables, it did truly struggle to maintain a lock in both the Radio Australia and Radio Riyadh recordings. Indeed, I was so surprised by how comparatively feeble the sync lock was on Radio Australia, that I disconnected the PL-660 from the recorder and moved to a different location to verify that something nearby wasn’t causing the sync lock instability. It was not; it was solely due to unstable band conditions. Very good, PL-680! Someday I’d like to compare the PL-680 with the Sony ICF-SW7600GR, which I’ve always considered to have, among current portables, the strongest sync lock. I wasn’t able to provide an audio survey of SSB performance since the PL-680 picked up too much noise from my digital recorder to make for a fair contest. Meanwhile, I’ve spent time listening to both radios in SSB mode and comparing the models. To my ear, both are very close in SSB performance, but again the PL-680 does have a slight edge on the PL-660 in terms of sensitivity and AGC performance. 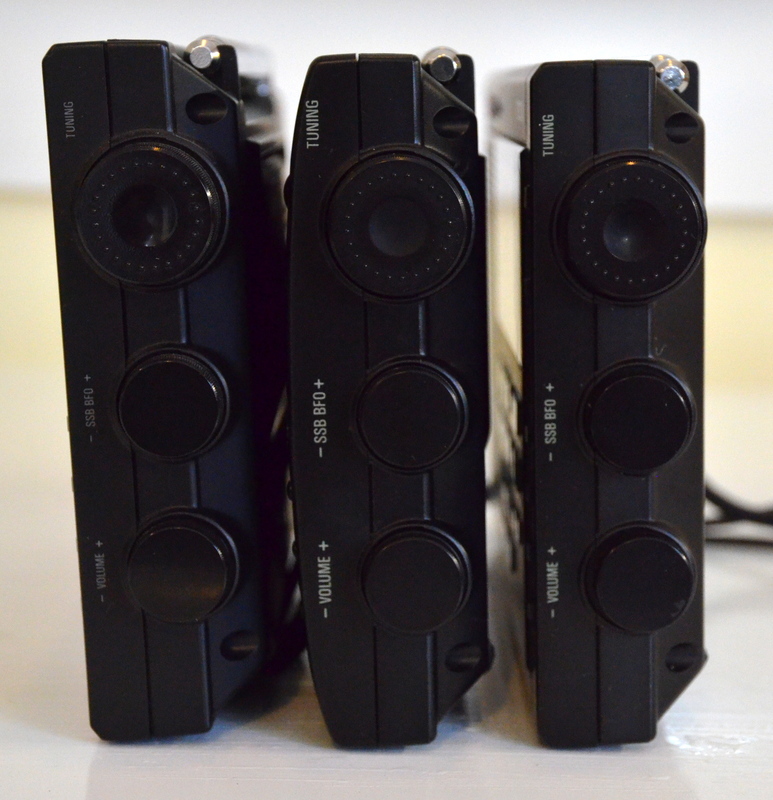 SSB audio fidelity is very similar in both radios. While I haven’t spent more than, let’s say, an hour with the PL-680 on the FM band, I have concluded that it is very sensitive–able to receive all of my benchmark local and regional FM stations. An informal comparison between thePL-680 and the PL-660 also leads me to believe that they are both excellent FM performers and seemed to compare favorably. I would certainly welcome FM DXers to comment with their own evaluations of the PL-680. I’ve also posted a medium-wave listener survey since many of you asked that I provide an evaluation of the medium-wave band. In short, here is where the PL-680 loses to the PL-660: whereas, on the shortwave bands, the PL-680 is more sensitive, it lacks the same sensitivity on the medium-wave bands. Though I believe the PL-680 does a marginally better job than the PL-660 of handling the choppy conditions of nighttime MW DX, the PL-660 still pulled voices and music out of the static and made them noticeably more intelligible. 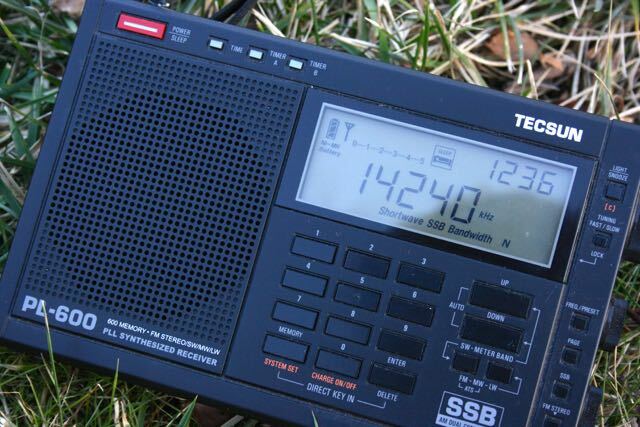 The survey result swung very hard in favor of the PL-660, which has long been one of the more notable medium-wave performers among shortwave portables. I provided a total of four sample broadcast recordings for comparison. Below, I have embedded one of them–a recording of 940 AM in Macon, Georgia, for your reference. You can listen to all four recordings in the original survey (again, note that Radio A is the PL-680, B is the PL-660). 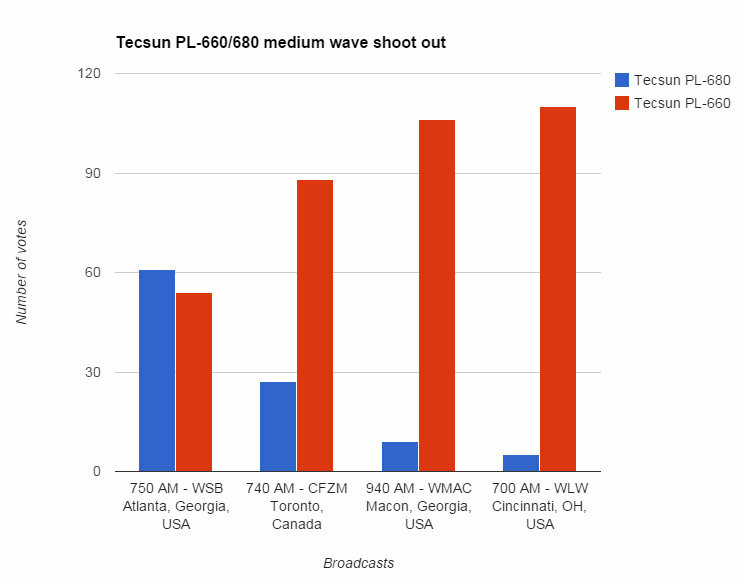 In all but the strong station sample (750 AM – WBS Atlanta), the PL-660 was preferred by a wide margin. 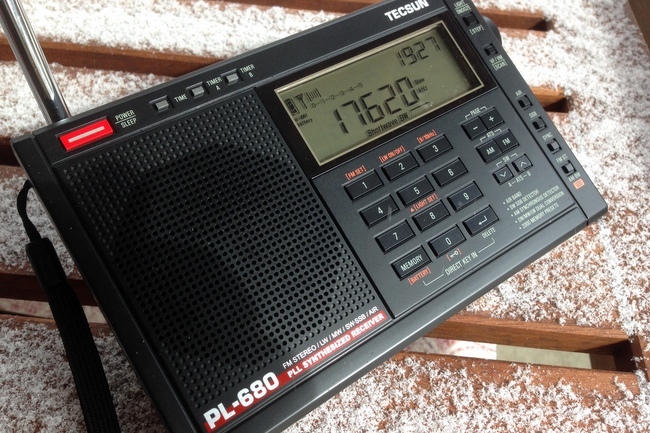 If you’re a shortwave radio listener, you’ll be pleased with the Tecsun PL-680. 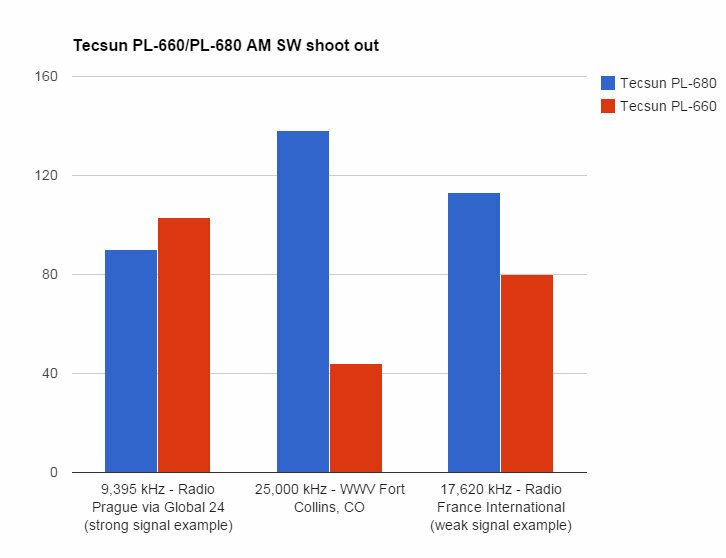 In all of my comparison tests between the Tecun PL-660 and Tecsun PL-680, the PL-680 tends to edge out the PL-660, performance-wise. This coincides with the user surveys, too. If you’re a medium-wave DXer, you might skip over the PL-680. That is, unless Tecsun makes a good iterative design improvement. If you’re a casual medium-wave listener, on the other hand, you’ll probably be pleased with the PL-680. All in all, I like the Tecsun PL-680 and I see myself using it more than the PL-660 when I’m on the go. 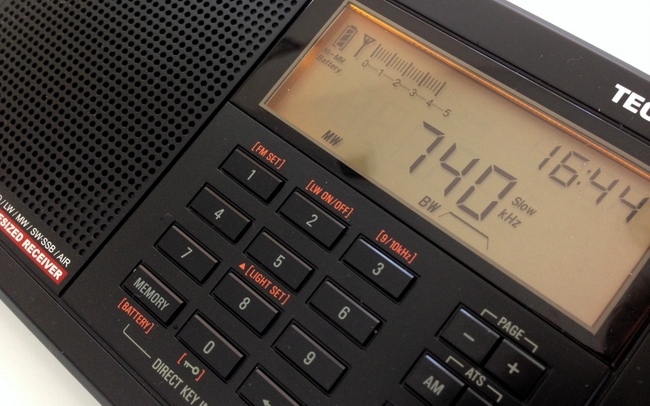 If you’re primarily a shortwave radio listener, the PL-680 may very well be worth the upgrade. At $95 US plus shipping, it is certainly a good value. Note that Anon-Co plans to post the Tecsun PL-680 for sale on eBay in March 2015. Click here to find the PL-680 on eBay. This entry was posted in Articles, New Products, News, Radios, Reviews, Shortwave Radio, Shortwave Radio Reviews, Uncategorized and tagged AM synchronous detector, Anon-Co, Medium Wave, PL-660, PL-680, Tecsun, Tecsun PL-600, Tecsun PL-660, Tecsun PL-660 review, Tecsun PL-680, Tecsun PL-680 Review on February 22, 2015 by Thomas. Anna [at Anon-Co] has the PL-680 in stock according to a email I received from her this morning. Readers who are interested in ordering the radio should be aware of the Chinese New Year and the potential for delays. Thanks, Steve. I received a similar email from Anna. They have listed the PL-680 on their website and, I’m sure, will post on eBay soon. The price is $95 US plus shipping; a reasonable price, if the PL-680 is an improvement over the PL-660. I have already ordered a PL-680 from Anon-Co and it is on the way. I paid extra for FedEx shipping, so it should arrive before week end. I’ll post updates as I test this radio. As Steve mentions in his note, Anon-Co will observe the Chinese New Year and will be unavailable from February 13th to the 26th. I *should* have at least a preliminary review posted before the 26th so those of you who are tempted by the PL-680 will at least have some insight prior to purchase. This entry was posted in New Products, News, Shortwave Radio and tagged Anon-Co, PL-680, Tecsun, Tecsun PL-680 on February 10, 2015 by Thomas.